Sean was the first trainer I ever worked with. Even though a friend recommended him, it still took me almost two years to actually make the appointment with him. It was intimidating. I had never worked out with weights before and exercise had always only been a social thing I did with friends because we got to hang out and get coffee afterwards. It wasn’t until after working out with Sean that I realized exercise would always be a part of my life, that I appreciate the health benefits from it, that I like feeling strong, and I like the confidence it gives me. When I walk through the RF door, I’m greeted like a friend, and it changes my whole attitude on the days when I’m cranky and don’t feel like working out. The camaraderie, support, and laughs from fellow exercisers and staff are exactly what I need to keep coming back. I love RF and am so thankful to be a part of such an incredible community of people who really care about you and want you to succeed in reaching your goals! The thing I like most about Restoration Fitness is that I never feel like I’m on a diet or that I’m forcing myself to work out. I look forward to my workouts and eating healthy foods. 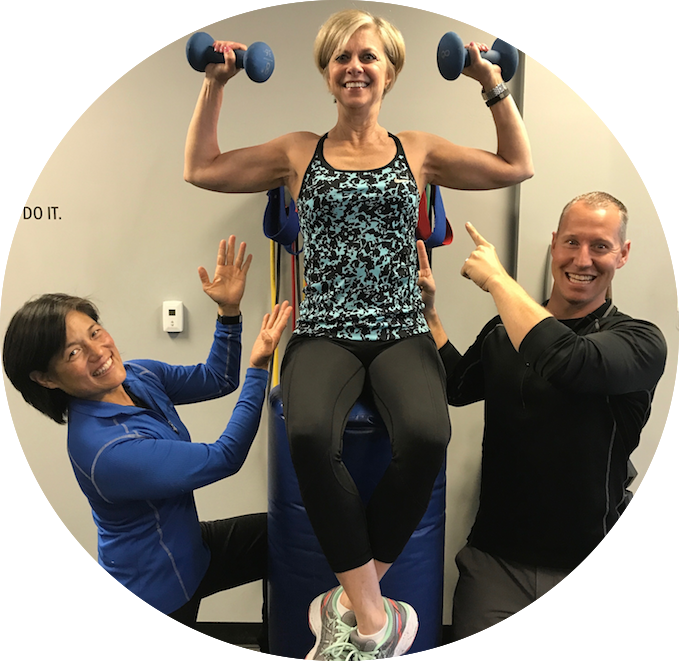 The passion of the trainers and the upbeat environment at the small group workout sessions provide accountability and make Restoration Fitness a fun place to work out. A year ago, I was bored with the large gym “scene” of performing the same workouts alone with little results and running half marathons while getting the same outcome. That’s when I made the choice to join Restoration Fitness. 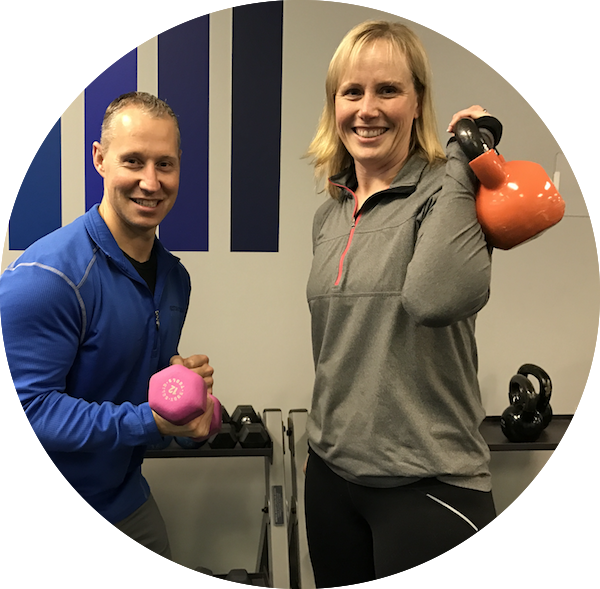 Although I thought I was in pretty good shape when I started working with Sean and Linda, I quickly realized I wasn’t the same athlete I was in college and suffered a back injury. 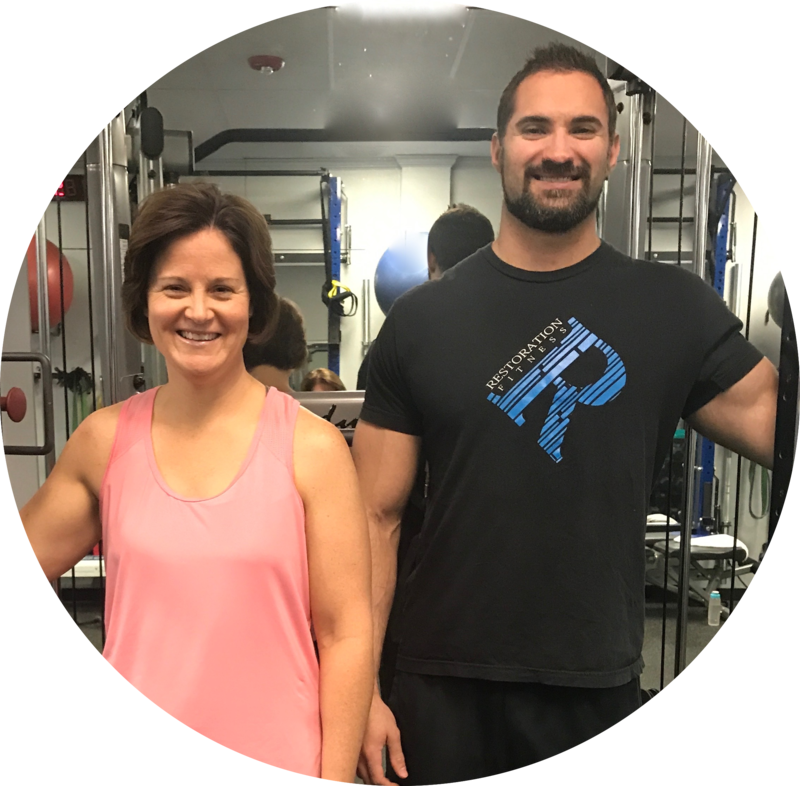 Sean worked with me to slowly rebuild my core muscles and correct my form so that I would prevent further injury. 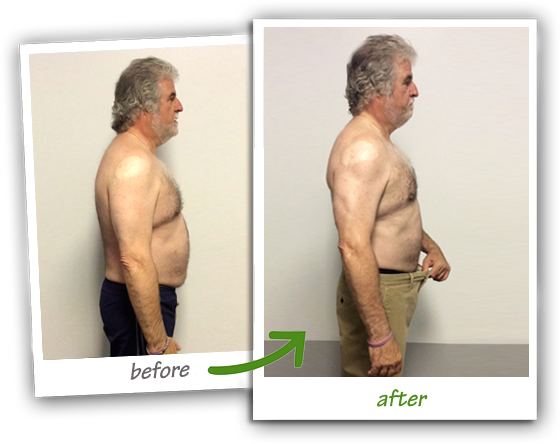 As a result, my core muscles are stronger now than they have ever been and I feel great! The hour I spend with the Restoration Fitness Family is a welcomed “me hour” that I am so happy I found! Since starting with RF my outlook for getting in shape has positively shifted. Rather than obsessing over the numbers on the scale and losing weight, I have approached each session with a desire to be healthy and strong, mentally and physically. 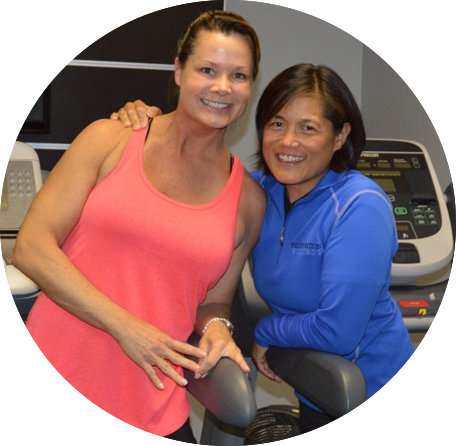 Linda continuously challenges me each week to meet (and exceed) my monthly goals. The support and encouragement of the group, as well as the varied and interesting sessions keeps me motivated. 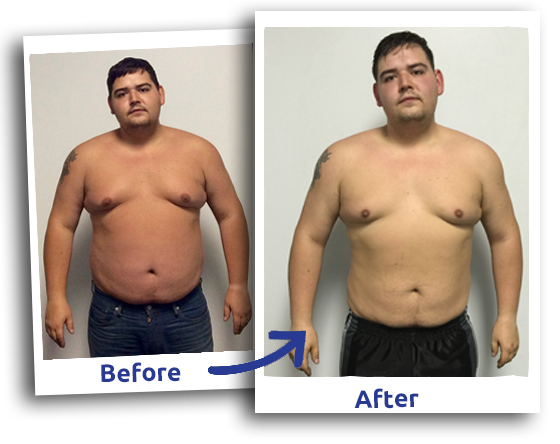 I have more energy and self-confidence now and, although not focused on the scale, I have also managed to lose 12lbs and 8% body fat! Thank you RF team for helping me realize I can achieve things if I get up and do them rather than sit back and think them. You guys are awesome! I joined RF in April of last year. 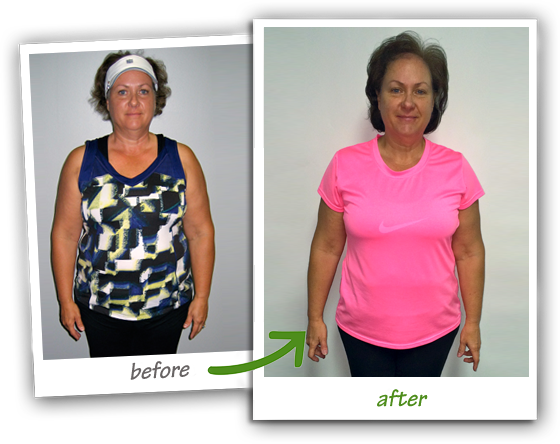 At that time my motivation for joining was to lose weight. I felt tired all the time. With working full time and a family, I found it hard to make time for myself. I have been working out consistently three days a week with Alex. He really knows my ability and pushes me to do my best with every workout. He challenges me to do more than I ever thought I could do. 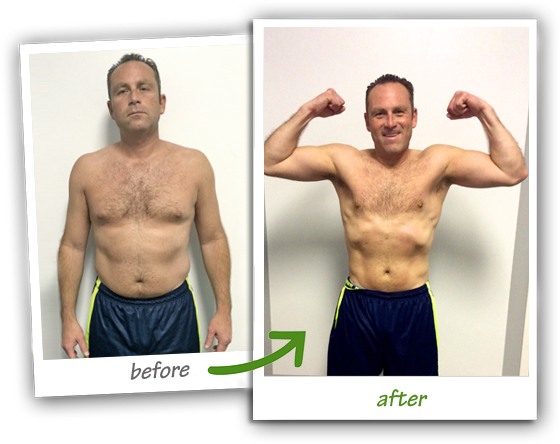 My regular meetings with Sean have taught me good nutrition habits and motivated me to stay on track. 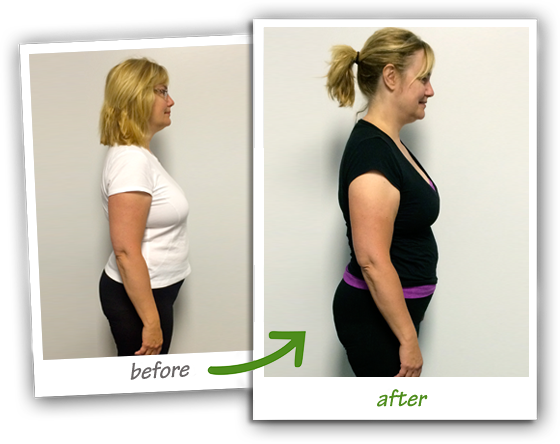 Since joining RF I not only have lost weight but feel healthier, stronger, happier, and more energized. Many thanks to all the team members of RF for making working out such a fun and positive experience!! 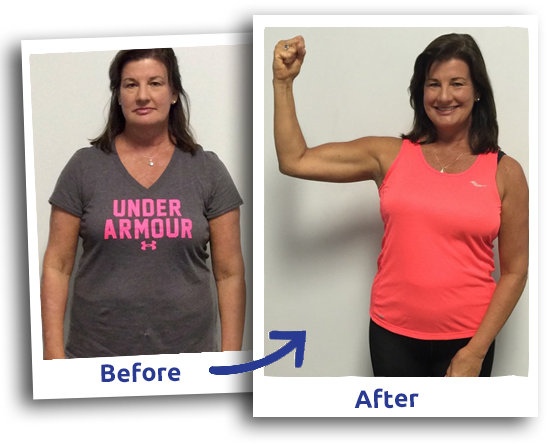 Since joining Restoration Fitness in February 2017 I have felt and seen a great improvement in strength, stamina and my level of fitness. Working with Sean Lee and Linda Donner has been a happy and rewarding experience. I appreciate their guidance and belief in me that I can do more than I think I can do. This has translated to a sense of accomplishment and confidence that I take with me when I walk out the door into everyday life. 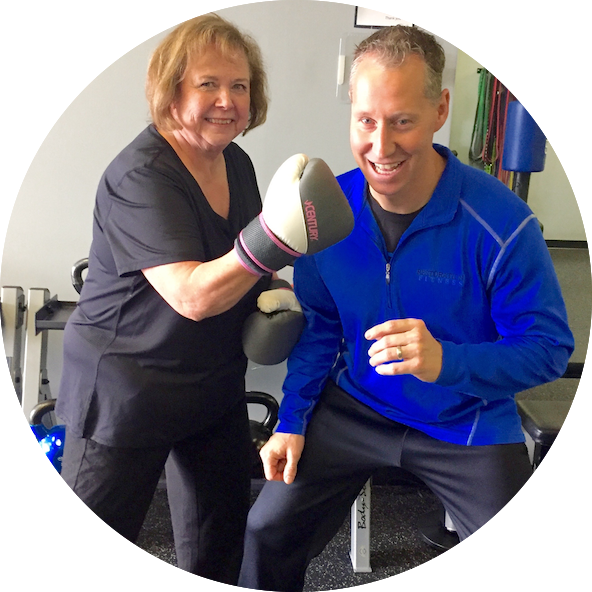 My thanks and praise to Sean, Linda, Allison and the Restoration Fitness family and friends that all support me and each other and encourage a healthy and happier lifestyle. Over the years I have joined countless gyms but always quit once I got bored or lost interest, never making it past a few months. I joined RF almost a year and a half ago & I am still learning new things every day! I actually look forward to my workouts and feel so accomplished after I complete each one. 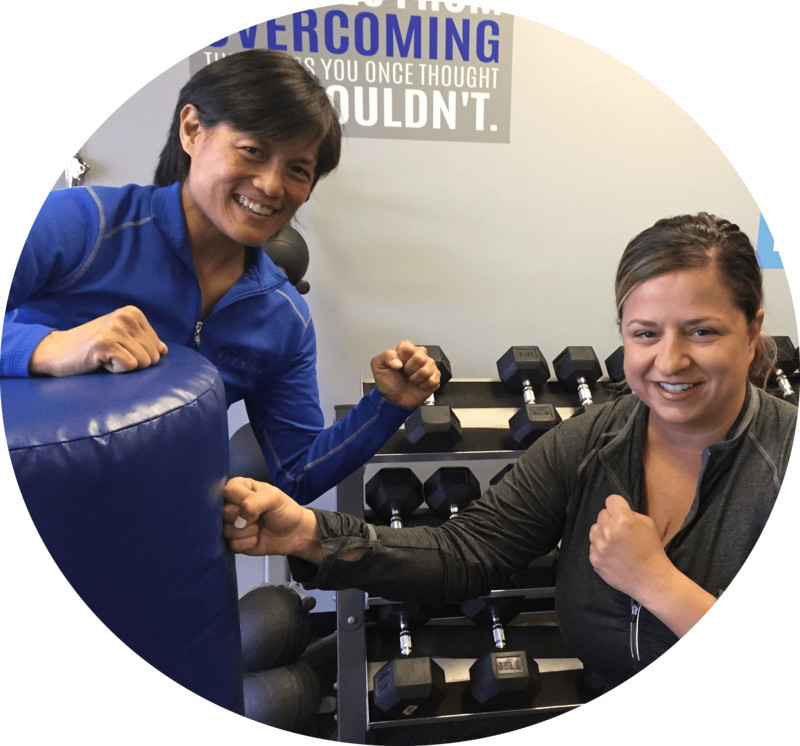 Instead of always focusing on the scale, Linda has taught me to strive to be stronger & always challenge myself to do more. 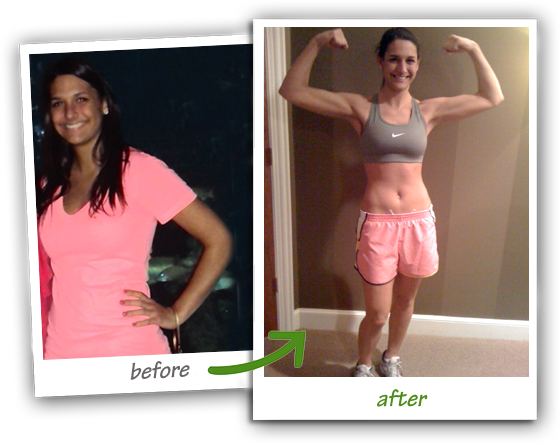 When I started the program I could barely make it through a workout without being completely winded. Now I find myself completing exercises I never could before. I can now concentrate on building upon what I have learned so that I can do more each time. Linda is always making sure I am challenged! I feel like a different person now that I've learned to focus on health & strength rather than the scale. Thanks to Linda & Sean for going along this journey with me & teaching me so much! 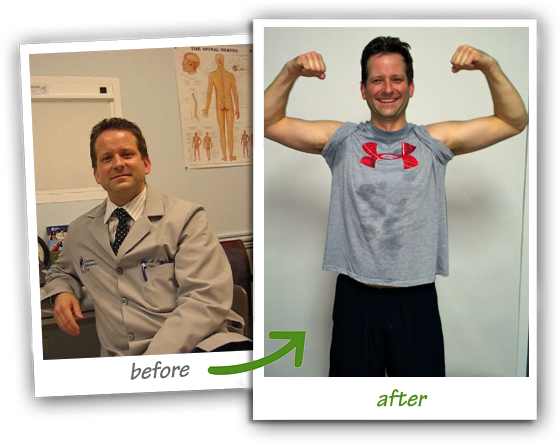 Before starting with Restoration Fitness, I had just about given up on my health. I could barely walk up the stairs because my knees hurt so badly. Not to mention, I was extremely overweight. I just thought this is the way I would spend the rest of my life. My daughter was pushing me to do something for myself and researched the local fitness options. 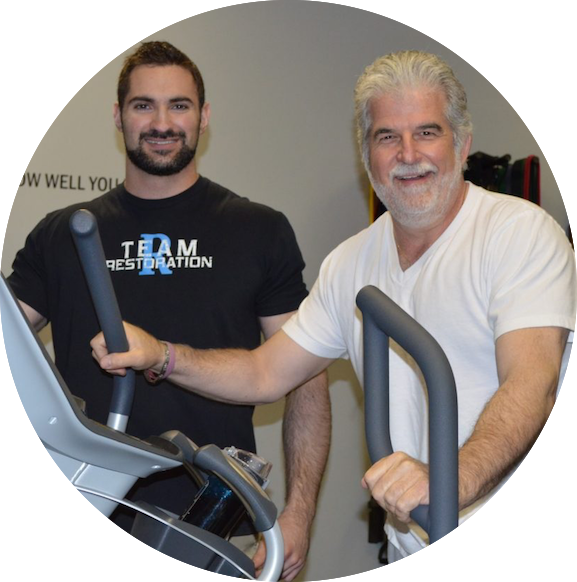 She came across Restoration Fitness and when I met with Sean in a consultation, he quickly made me feel comfortable. I am happy to report that my knees have gotten so much better! I am able to go up and down stairs without holding on. I’ve lost weight and feel so much better about myself. Sean and his team pushed me to do things I never thought I could and they also understand and respect my limitations. They are so supportive! I would not be where I am without them! ARE YOU READY TO BEGIN YOUR STORY WITH US?